Win Ottomeier ran down the library steps with light restraint. She was anxious to be on her lunch hour but didn’t want the others–Marie, Theo and Antonia–to take any notice of her. They sometimes ate together but usually not, as they liked to talk shop and gossip and she more often liked to not talk. Her hour was important to her, a time to empty her mind of a million orderly bits of information, of the sight of the heavy books she consulted as well as the glaring screen of the computer with its cornucopia of search engines. And the people, oh the public, how they often swarmed her desk with their eager faces, located her on the phone, their words spitting and swirling up to the Rubenesque women cavorting on the ceiling’s mural. To Win, it was a veritable storm of faces and hushed verbiage from the moment she walked in, esoteric inquiries and needs. Not that she didn’t like data. There was a solid appreciation of the ways one made sense of micro and macro worlds, how she could conquer and divide until the facts were distributed or disposed of correctly. Win did not complain when the first computer system went in all those years ago. Adaptation brought rewards. It complemented her studied reserve, that sleek machine. But it was her twenty-first year at the city library and she was becoming–what? Disengaged. Bored. Libraries had enchanted and upheld her, even saved her life a few times. Her work had mattered once. But now it all pressed in on her like a too-small room. She felt she was becoming irrelevant as people did more of their own digging, PCs in hand. And then there were all those virtual books, disturbing in their untouchable distance, their convenience. The images of an increasingly synthetic world mystified and daunted her. At times Win had desperate fantasies of heading to the airport and buying a one way ticket to, say, Patagonia, where Magellan thought he had stumbled across native giants in 1520. At five foot eleven they had seemed enormous to the small Spaniards. But that was a view from history. When she got there, what then? There was petroleum and tourism and who knows what other irritants. She had only to look it up to find out, so why bother going at all. Still, she asked herself: how much could one person absorb in a lifetime? Especially if one had a near photographic memory as Win did. She would go to her grave with footnote 219 on page 367 of a tome regarding prehistoric America emblazoned on her brain. Where was the meaning to it? This is what she had been plagued with during sleepless nights: the exhaustive nature of fact gathering and what it all boiled down to, at this point in her life. Living in a junkyard of data, that’s what. She carried on in an expert loneliness infused with random, electic knowledge no one really cared about. Not even Win, anymore. So at twelve-fifteen on Tuesday, she slipped out and headed three blocks down to Tate’s Lounge. She liked the soup and sandwich special there. And the drinks. They all greeted her like a regular. It had surprised her a couple of months ago. Had she gone there that much? Since March when she discovered the place on a particularly soggy day, Win had been stopping by during or after work, maybe once or twice a week since summer began. She looked over her shoulder to make sure her co-workers had turned the corner as usual, seeking out Indian or Lebanese fare. Then Win took the last booth and ordered a bowl of soup and a half gilled cheese. Zina, the waitress, called her by name and asked how the books were doing. Win answered, “They’re looking great, standing at attention as usual.” The waitress chuckled; she was a tolerant sort. It was such a relief to be here. The place smelled of onions and peppers, grilled sausages with cheese, creamy chicken soup. It was very unlike Win’s kitchen which was gleaming and small, the refrigerator sparsely populated with yogurt and orange juice, take out Thai leftovers, a handful of brown eggs. Two bottles of wine. Win finished the remainder of the chicken soup and wiped her mouth with the thin napkin. Now for dessert. She reached for her vodka and cranberry and sipped once, then let the vibrant mixture fill her mouth a few seconds before swallowing. It was calming, tart, smooth. It was just the antidote for all the faces and tongues wagging and the tangled weave of supposed facts, data parading itself before them all as though it was critical to something, the final word. Win breathed in the scent of her drink and finished it off quickly, then sat back. The last word was something her husband, Harry, once enjoyed. She should not wear anything but sensible shoes or she would have bunions, she was not to clean the oven with nasty chemicals, she was cautioned to not spend more than allotted for Christmas despite her desire to get something really good for the nieces she loved so. He’d even had the last word on whether they would have children–not a good idea, not in this crazy world, not on their improving but modest income. But he did care for her, didn’t he? Didn’t they take a week’s vacation at a national park she picked each year? Didn’t he cook dinner three times a week? What did he tell her every night before they parted ways at their respective bedroom doors? “Rest well, old gal.” She got and gave a medium hug and it counted most days. She thought she couldn’t manage but she did; discipline went a long way toward getting through things. It was more and less than what she thought, this being by herself. It hurt less in some ways, not at all in others. His face receding, she ordered another vodka and cranberry. Just saying the drink’s name out loud calmed her: a healthy fruit full of antioxidants with a fortifying alcoholic beverage. Harry hadn’t wanted her to drink, not even a drink made with cranberries. “One makes you a bit goofy, two makes you unpredictable,“ he’d said, as though either was character defect she needed to avoid. Perhaps so. The wine she drank, then, was drunk sparingly, a half glass when he was watching, two or more when he was not. Now she had endless nights to watch the skies and the city’s bustling business from the tenth floor condo, a glass or three of wine keeping her company. And she had the afternoons weekly, one at the least, two if lucky. She could sit and drink, float away. After awhile it felt as though she was on a fanciful barge decorated with multi-colored lanterns, headed down the Nile or the Colorado or even the Columbia River which lay just beyond the condo, rushing to join the Pacific, salt and fresh waters mingling. When she got back to her post, no one at the library ever said anything. They might look bemused, but that often seemed the case to Win. She decided to order a third drink despite the waitress–was it Zina or Zinia? –raising her eyebrows, biting her lip. “Of course, in a few minutes.” Win shrugged off her discomfort, drank away the dullness she felt. She wanted to say so much more: I can drink as much as I like now. Harry has no say. I am not thirty; I’m hanging on to sixty by a thread so I am a full-fledged grown-up who makes my own choices. I deserve a break, a change in routine. I am happy as a clam nestled in this booth. I am a talented research librarian but truly sick to death of gathering information instead of living it and so I am drinking to think it over some more. Win finally got up, gathered her purse and wobbled to the register, paid her check and with a nod to Zinia (of course, she knew that), left. 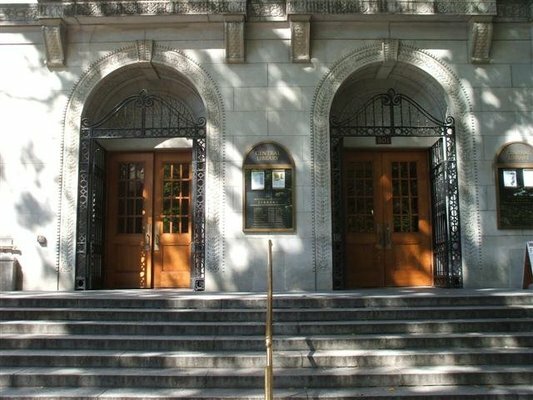 She walked gingerly down the sidewalk–lest she lose her balance and look a fool–then climbed the library’s steps to the brass-handled doors and yanked one open. She took the elevator to the third floor and walked right up to Antonia’s huge desk. The lovely old dear had a pencil in her mouth as usual but took it out as soon as she looked up. Win turned to go and lost her center for a moment. But there was Theo, who had always looked good to her, even when he’d lost the last of his hair, even when he’d dropped too many pounds after his divorce. He took her elbow in his hand and sidled down the stairs with her. She smiled, almost kissed him, but instead shook her head and plucked his hand off her elbow. Then Win left without a backward glance, just slipped away to Argentina.